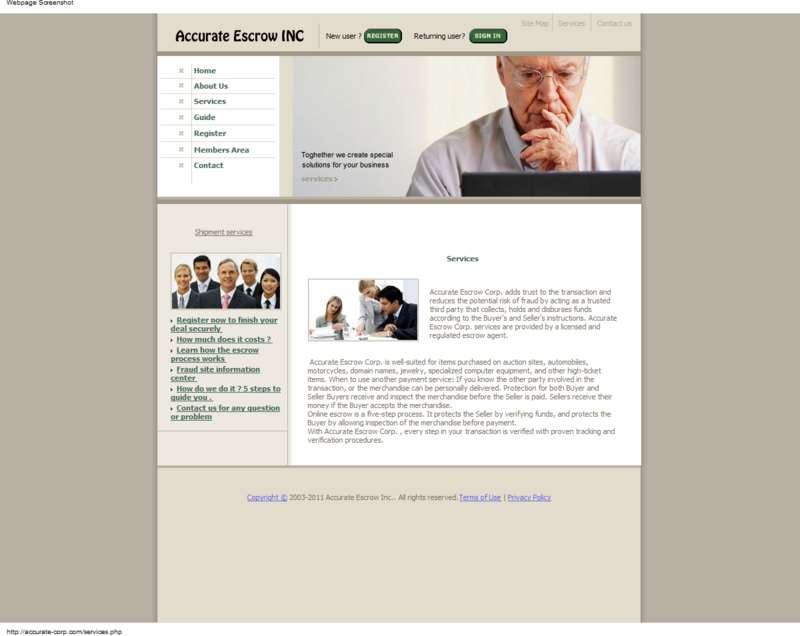 Accurate-Corp.com aka Accurate Escrow Inc. is a fake escrow site targeting eBay jewelry scammers. "We would like to remind the Seller that the expenses of sending and receiving the money will be charged to the consignee. For information on bank's charges please send us a mail to support@Premiere-Corp.com"
Unfortunately I have just found your site but thought you would like my details to add to your list!!! In hindsight, like everyone, I am sure one feels a right idiot to have been taken in but at the time they have everything so tightly covered that it appears okay. 1. Received initial interest from ebay member potterychef1 who has a listing of 416 with excellent references from people, albeit as a buyer or a seller. As I was unable to send him an email which was, allsoppgreen @ gmail.com he suggested I send further pictures of the watch to his other e-mail allsoppgree@hotmailcom, which turned out to be as I thought, his mother in Madrid, Spain. We carried on with interesting e-mails back and forth until she made an offer of £6,000 plus escrow service and shipping. 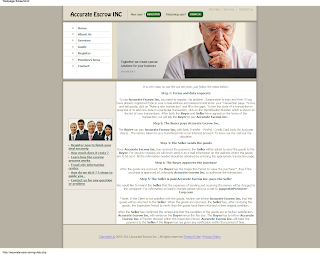 She suggested the service of Accurate-corp.com which always came up with Accurate Escrow Inc. I registered and was given a transaction no., whereby she paid the money into them and it was showing with "waiting confirmation from buyer". 2. Being slightly apprehensive I checked their license and everything seemed above board. I therefore shipped the watch out to: Delia Allsopp, Calle de Campezo Nr.4, Madrid, Spain, 28022 by FedEx at my cost. At first FedEx said it was undeliverable as the address was wrong but they mistook the 4 for an H. They then delivered it again but it was signed for by a SVicente at Campezo Nr. 3. When we went mad about getting it signed for by the wrong person and at the wrong address they have since come back and said that it was a hotel and that the receptionist had signed for it. 3. At the moment we are claiming from FedEx for misdelivery as I also had paid extra for insurance. I have written this in the hope that it may help someone else. Although I see by your list that there are many of us that have fallen for this type of scam. In the scheme of things - we are not in Japan where the loss is far greater. You have made a deal with someone who lives thousands of miles away. If you are the Buyer, you can't be sure that you will receive the item you have agreed to purchase and the Seller can't be sure he or she won't receive a bad cheque. We make sure that the cheque has cleared before instructing the Seller to ship the item. Both Buyer and Seller are protected. 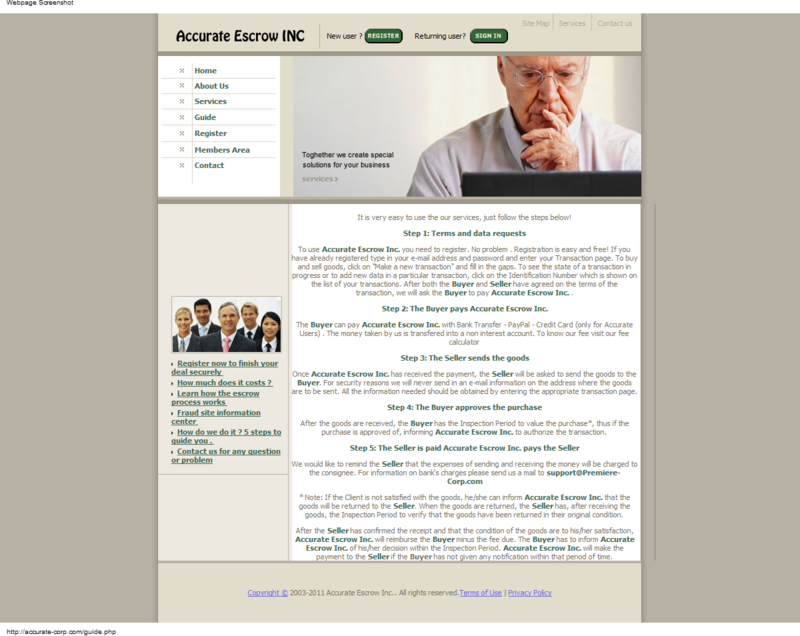 Accurate Escrow Inc. is an independent escrow company based in California. Accurate Escrow Inc. is hosted on secure servers using the latest in encryption technology. 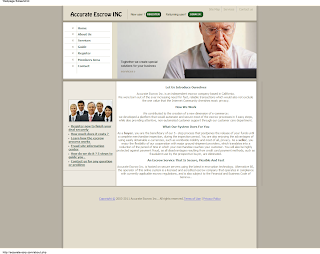 Alternative BS, the operator of this online system is a licensed and acredited escrow company that operates in compliance with currently applicable escrow regulations, and is also subject to the Financial and Business Code of Geneva.. Accurate Escrow Corp. adds trust to the transaction and reduces the potential risk of fraud by acting as a trusted third party that collects, holds and disburses funds according to the Buyer's and Seller's instructions. 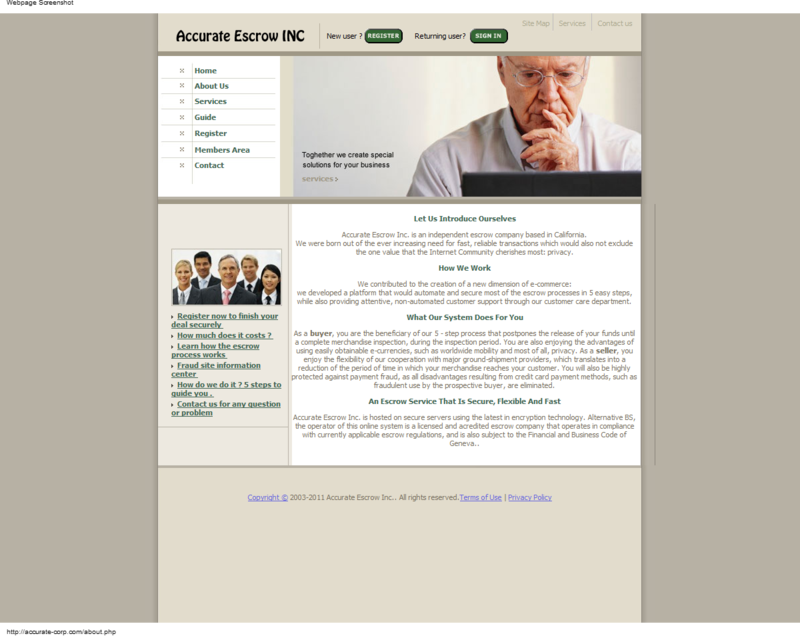 Accurate Escrow Corp. services are provided by a licensed and regulated escrow agent. 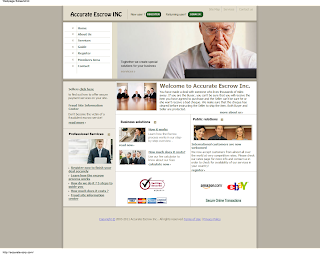 Accurate Escrow Corp. is well-suited for items purchased on auction sites, automobiles, motorcycles, domain names, jewelry, specialized computer equipment, and other high-ticket items. When to use another payment service: If you know the other party involved in the transaction, or the merchandise can be personally delivered. Protection for both Buyer and Seller Buyers receive and inspect the merchandise before the Seller is paid. Sellers receive their money if the Buyer accepts the merchandise. 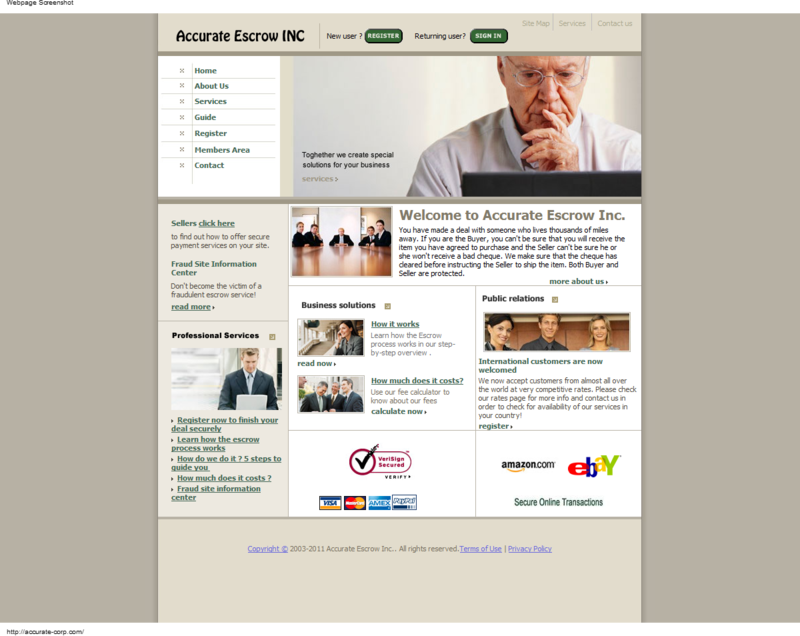 With Accurate Escrow Corp. , every step in your transaction is verified with proven tracking and verification procedures. 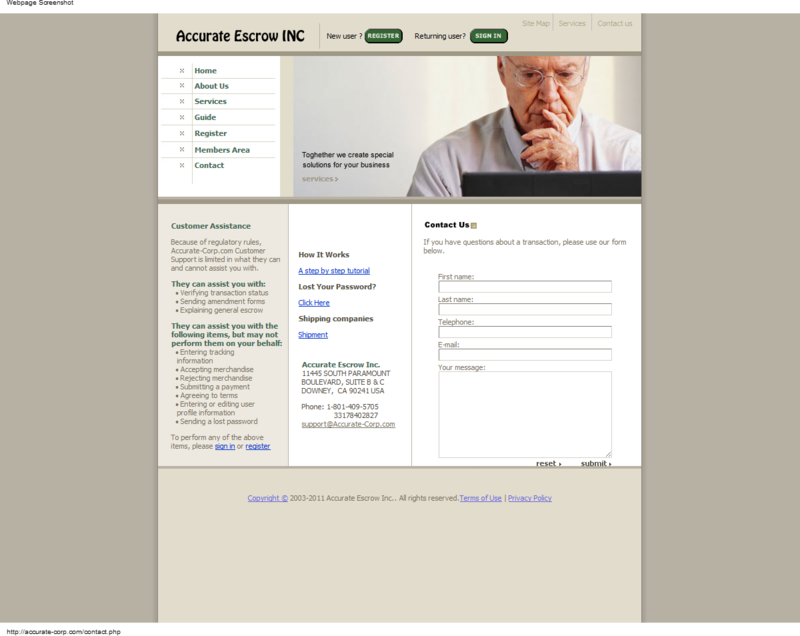 To use Accurate Escrow Inc. you need to register. No problem . Registration is easy and free! If you have already registered type in your e-mail address and password and enter your Transaction page. To buy and sell goods, click on "Make a new transaction" and fill in the gaps. To see the state of a transaction in progress or to add new data in a particular transaction, click on the Identification Number which is shown on the list of your transactions. After both the Buyer and Seller have agreed on the terms of the transaction, we will ask the Buyer to pay Accurate Escrow Inc. . Step 2: The Buyer pays Accurate Escrow Inc.
Once Accurate Escrow Inc. has received the payment, the Seller will be asked to send the goods to the Buyer. For security reasons we will never send in an e-mail information on the address where the goods are to be sent. All the information needed should be obtained by entering the appropriate transaction page. After the goods are received, the Buyer has the Inspection Period to value the purchase*, thus if the purchase is approved of, informing Accurate Escrow Inc. to authorize the transaction. * Note: If the Client is not satisfied with the goods, he/she can inform Accurate Escrow Inc. that the goods will be returned to the Seller. When the goods are returned, the Seller has, after receiving the goods, the Inspection Period to verify that the goods have been returned in their original condition. After the Seller has confirmed the receipt and that the condition of the goods are to his/her satisfaction, Accurate Escrow Inc. will reimburse the Buyer minus the fee due. The Buyer has to inform Accurate Escrow Inc. of his/her decision within the Inspection Period. Accurate Escrow Inc. will make the payment to the Seller if the Buyer has not given any notification within that period of time. Hi, I just wanted to add my latest experience. First of all the watch was listed for 2000 pounds. I started with checking CONTACT number in google. It immediately listed FRAUD. THen WHOIS - this web was registered ONE DAY before seller contacted me! There's more but I guess enough to be sure Its a fraud! Just wanted to worn you guys.